Hearing Duran Duran sounding as good as they ever have with an exhilarating collection of expertly crafted pop is a pure joy. Every time a new Duran Duran album is released, there seems to be an almost irresistible compulsion for some writers to herald the “comeback” of the “'80s pop heroes” or some such nonsense. Quite simply, anybody who says that hasn’t been paying attention -- Duran Duran never left. They’ve been releasing albums, most of them quite excellent, on a regular basis since their self-titled debut hit shelves 34 years ago. And are they really an “'80s band” when they released five albums in the ‘80s and nine albums from 1990 through today? Sure, their biggest commercial success by far came during the MTV era when videos like “Rio”, “Hungry Like the Wolf”, “Save a Prayer”, and “Union of the Snake” drove a manic hysteria that recalled Beatlemania. They did have a spike of popularity with their dual classics “Ordinary World” and “Come Undone” from 1993’s Wedding Album, but since then they haven’t made much headway in the Top 40. But as we all should know, just because a band’s sales figures no longer measure up doesn’t mean they’ve stopped making great music. Limiting them to the old “'80s band” label does them an injustice, and overlooks all the great music they’ve put out in the last 25 years. It’s time for a serious reassessment of Duran Duran and their place in music history. As they prove yet again with their latest triumph, Paper Gods, Duran Duran is one of the most consistently entertaining bands of our generation. Most of their peers from the gloriously decadent ‘80s are either long gone, or are riding the oldies nostalgia circuit, playing their old hits in small venues. Not so Duran Duran. They’ve remained fresh and inventive, never content to repeat themselves, always with new tricks up their stylish sleeves. Although Duran Duran has endured some lineup shifts, as do most bands with over 30 years of history, the core of Simon LeBon, Nick Rhodes, Roger Taylor and John Taylor has remained remarkably solid. Mark Ronson, one of the top producers in the business and the band’s collaborator on their fantastic 2010 album All You Need Is Now, is once again behind the controls. He’s joined by co-producers Mr. Hudson, Josh Blair, and one of pop music’s ultimate hitmakers, Nile Rodgers. Rodgers has a deep history with Duran Duran, having worked with them on some of their most memorable hits. His remix of “The Reflex” became their first ever #1 single in America. He also produced the smash “Wild Boys” and their fantastic 1986 album Notorious. When news hit that Duran Duran was working with both Mark Ronson and Nile Rodgers on their new album, anticipation amongst fans understandably soared. Happily, while the album is not quite on par with All You Need Is Now, the collaboration is as successful as anybody could have hoped. Paper Gods is more pop and dance oriented than its guitar-heavy predecessor, but by no means does it sound like a desperate attempt to appeal to a generation who makes fun of their parents for singing “Please please tell me now! Is there something I should know?” at the top of their lungs in the mini-van. Paper Gods is just a great pop album -- mature, sophisticated, and intoxicating. Sure, there are nods to their ‘80s heyday in the music and in the sly visual allusions on the cover art. But even with those coy winks to the past, Paper Gods is firmly planted in the present and future. It’s a thrill hearing Simon LeBon’s voice, sounding as good as ever, over the sinuous, spacey electronica of the seven-minute title track which opens the album. It’s followed by “Last Night in the City”, an electrifying rocker featuring guest vocals by the talented Canadian singer Kiesza. It has one of the strongest melodic hooks on the album with its soaring chorus, and should be a serious contender for next single. The dramatic “You Kill Me With Silence” is a moody, wounded reflection on a fading relationship, with slinky synths and searing, distorted guitar near the end that bubbles to the surface like molten steel. The album’s first single, “Pressure Off”, is a spirited slice of funk-pop featuring guest vocals by the versatile R&B sensation Janelle Monáe. It's as tight a pop anthem as any in Duran Duran’s career, and stands tall alongside their legendary hits of the past. “Face For Today” is a stuttery new wave revival with an emphatic groove and booming bass. As with much of the album, flashes of retro synths jolt out from the sleek, modern pop vibe. “Danceophobia” is a hard-charging dancefloor epic with a pulsating rhythm and bright flares of shimmering keyboards. It’s vaguely reminiscent of the Timbaland-produced tracks on Duran Duran’s 2007 release Red Carpet Massacre. There’s even an appearance by Lindsay Lohan in a brief spoken-word section with her voice computerized (yeah, the idea sounds cringeworthy, but it actually works). If this track isn’t a single with multiple remixes, it will be a shock and a missed opportunity. “Danceophobia” should have club DJs salivating. The gorgeous ballad “What Are the Chances?” swoons and sways majestically in the tradition of classics like “Save a Prayer”, “My Antarctica”, and “Ordinary World”. The former Red Hot Chili Peppers’ virtuoso John Frusciante weaves his guitar through the melancholy grandeur like a hot razor slicing through the dreamy, cinematic waves of keyboard. Another standout is “Change the Skyline”, an edgy dance-rocker with kinetic synths bouncing over a fiery groove. It features Jonas Bjerre, vocalist for the outstanding Danish band Mew, whose beautifully airy vocals blend seamlessly with LeBon’s. Backing vocalist Anna Ross shines on “Butterfly Girl”, a soulful rocker with an absolutely blistering guitar solo by Frusciante. The album closes with back-to-back six-minute epics. “Only in Dreams” boasts one of the more ambitious arrangements on the album, with graceful harmonies floating delicately over the wickedly tight and funky instrumentation. The slow-burning “The Universe Alone” ends the album with simmering drama. “I’ll see you in some other lifetime / on the other side of what we’ll never know / together we have walked a fine line / now we go to face the universe alone,” LeBon sings in perhaps his finest vocal performance on Paper Gods. Frusciante again adds an elastic guitar part that coils around and through the deft electronic beats and keyboards before the whole thing descends into apocalyptic static and distortion, with an angelic chorus rising at the very last moment as it fades to silence. Paper Gods is a sonic marvel, beautifully produced by an ace team of collaborators. The sounds pop out of the speakers from every direction -- it’s an exciting feast for the ears, with always something new, unexpected and alive. Listen to it in the car on full blast, but then try it on headphones to experience all the careful attention to detail and nifty sounds that emerge with repeated listens. Almost every track could be a single, and there was plenty of strong material left over judging by the excellent bonus tracks hiding on the album’s deluxe edition. Hearing Duran Duran sounding as good as they ever have with an exhilarating collection of expertly crafted pop is a pure joy. For those fans who only know Duran Duran’s mega ‘80s hits, do yourself a favor and check out Paper Gods immediately. And while you’re at it, seek out some of the lesser-known gems in their catalog like Medazzaland and Pop Trash. Most definitely take the time to absorb their superb 2010 release All You Need Is Now. The ‘80s hits are great and it was an amazing era for them and many other artists, but it’s time for Duran Duran to be recognized for what they are: one of the most consistently innovative and electrifying pop/rock bands of the last 35 years. Nostalgia is all well and good, but Duran Duran is every bit as vital in 2015 as they were in 1983, and whether it’s reflected on the pop charts or not is wholly irrelevant. 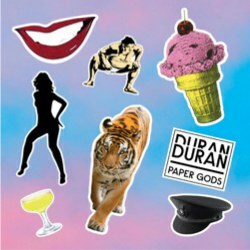 In a statement on the Duran Duran website marking the release of Paper Gods, Simon LeBon says, “Please spare us the 50 or so minutes that it takes and listen to Paper Gods from its opening note to its closing echo. I promise that you will not be disappointed.” The man knows what he’s talking about.